The unusual season on the Gold Coast has manifested itself in various ways, but right now Bugs is concerned about the state of the Snapper bank. The Quiksilver Pro waiting period begins in a fortnight and the sand is in a parlous state. “We’ve had a hole at Snapper since about October,” Bugs explains, “which was followed by a full season of northerly winds.” To create that ruler-edged line, the Superbank requires southerly winds to create a longshore current that transports sand from the Froggies outlet, around Snapper Rocks, and then lays it down smoothly along the length of the Superbank. Without the regular feed of sand, wave action serrates the bank creating irregular sections or holes such as the one currently at Snapper. I reply that I had. But TC Oma was almost a month ago. What’s the state of the sand right now? 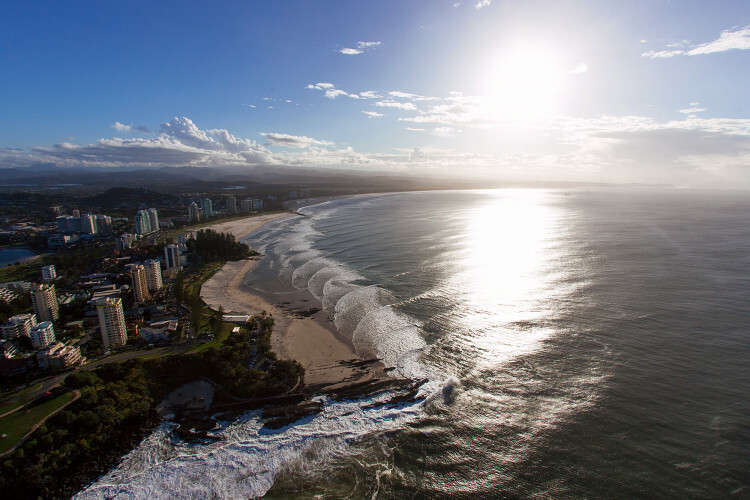 Froggies is the small beach immediately south-east of Snapper Rocks and it’s crucial to the Superbank because it’s the location of the primary outfall of the Tweed River Bypass System. The sand that would otherwise be trapped on the south side of the Tweed training walls now gets pumped to the ‘Snapper Rocks East Outfall’ - i.e Froggies Beach. This is the part where various elements have to align, because, as Bugs has observed, the sand has almost filled Froggies and is ready to again overflow, but for Snapper to benefit the current has to be flowing in the right direction. It needs a southerly swell. As we speak the workmen are building the giant marquee at Rainbow Bay, and all the while the sand is piling up at Froggies getting closer to the point it spills over and, weather permitting, builds the most important piece of infrastructure on the point. "It's interesting, isn't it? Like the field is wide open this year. We've got John John here now, he's arrived early, and I know he's returning from injury, but that to me is a real statement of intent." "But then it's so hard to go past the Brazilian trio of Filipe, Gabriel, and Italo. If the conditions are right then I'd say Filipe....but then Julian is also a favourite, it was incredible what he did here last year, and it wasn't a one-off, he was in the running till the end. He'll have a fire in his belly." "And you know, what if it's pumping? You would've seen the footage of Jack Freestone during Oma. Who couldn't pick him after that performance?! It feels like Jack knows he belongs there on the CT. Same with Ryan Callinan, and Jordy Smith, he's a veteran now but he hasn't slowed. Kelly Slater is also in the mix as he always is." "If it's 2-4 foot Snapper then I'd say Filipe...or maybe Julian. If it's big behind the rock then one of the Wright family, and if it's down at Kirra then Jack." The surfing world is so small. Went up to watch the Snapper comp last year . Grabbing a bit of brekky at a nearby cafe and there’s two other customers- Pat O’Connell and Bob Hurley having coffee - then in bounds Rabbit with the exact same style of report and a call for best period of waves for the day and who would be ripping hardest. Then off he bounded with a big grin on his face . He looked like a kid at Christmas. The scale of the infrastructure gives a glimpse into the coin being spent on the event and for it all to be dependent on the whims of Huey is pretty classic. They can pump sand all they want , but if Huey isn’t into it the Dirk Ziff is just banging his head against a wall. You can see why they’re dying to shift to wavepools. Medina for the win....big dog’s gotta eat. The puppies get scraps. Parko flogged him in that final a few years ago . No doubt. Premonition- Someone’s going to go big on the end section of Marg’s right and get hurt this year. Italo ? And the truth is, with the sand pumping and a "normal" season, Snapper is about the most reliable venue in the whole pro surfing calendar. at 2 ft it's fun, and if it's big then it's decided in Kirra barrels. I'd love a little sand pumping action here right now to help out the Points; they are in woeful state. Your also longtom on BG? You’ve been writing some really good stuff . Enjoying it. Agreed. Always enjoy a longtom read. When i read your comments here though its like a different person. Yep - Snapper in April is probably the most reliable, fun location in the world, in a normal year. The 'best ever' swells might have historically been in Feb/March, but that time of year, in the absence of a cyclone, is generally limited to easterly windswell and sectiony banks. Normally April/May are unbeatable in the consistency department as the south winds have spread out the sand, every morning is light offshore, and an endless train of fun tradeswells are mixed in with the possibility of a late-season cyclone or early southern ocean swell. Unfortunately this year is far from ordinary, and a notable lack of southerlies has left Snapper devoid of sand. That’s it . I’m up there this year. I’m getting some derby day horse blinkers made up out of neoprene. Not going to look left once ! Did you ever notice what's going on at 1.32 in that vid?? Froggies leapfrog from behind the Rock. Snapper sinkhole submersible to Little Mali. Desert Island Disc has long been a broken record in the Cooly Gold Jukebox. DJ Bugz just puts a new spin on it each year...We all know it's the same ol' song! A Decade on long after Border Patrol Guards buried all the Points & Hi-Rises. Snapper Sinkhole just sits there staring up at Pro Surfers having the last laugh. The only live surf heat I have seen was rabbit v Carrol, final stubbies Burleigh 83 I think. You were robbed rabbit blatanty. Tom did one closeout top turn and you were flying down the line doing combos. That was the '84 Final. I don't have that one on video but here's the '86 Stubbies that includes a Rabbit vs TC heat. Unfortunately this clip is cut into excerpts but we've got the whole hour long episode laying around somewhere. For years I thought the cheesy "live, studio narrator" was Shaun Micallef but we've since found out it's not him but Rob Brough, the cheesball that used to host Wheel of Fortune on the tele. Still, there's some classic footy of Rabbit, young Occ, Kong, Carroll, Curren. We'll dig out the longer version soon. That South Qld light and water colour is just magic. Tell me you don’t want to jump in and marinate in it. Very much a fan of Swellnet TV. Any old thing you feel like releasing to the world would be appreciated. Rob Brough was family feud. I liked the interview with Occy's girlfriend haha. I was under 10yo at the time. Is that a valid excuse? Stu, that southerly swell isnt looking as promising as it was 24 hours ago. You're right, it's all fallen apart. Maybe they'll have to follow Rab's call of "five laydays" before the sand is any good. Locals appreciate that Noosa > Burleigh > lead up to Quickie...nice flow on Stu! About those Stubbies cameos...Where are they now? Bugz/Kong/Occy/Tommy have all been back to compete @ Burleigh Single Fin..
Bugz is undoubtedly GC/Surfings finest ambassador & everyone's go to surf buddy. Occy just placed runner up to Tom Carroll in 1st Heritage Burleigh Single Fin. Rob Brough played (Himself as 4GG reporter in Cooly Gold) Mad Keen on the mike! Pretty sure Rob surfed...How to decide which was smoother the Perm or the Voice? Very friendly person with heartwarming smile...a real genuine type. GC 4GG >Prime News > Sunny Coast > NQ News knee deep in The Flood . Rob's Family Feud later became a homefront ordeal with Brother from Hell! Swellnetonians know brother as Tony's shirt fronter "Mal Brough"..yeah! That one! Rob wins a Gold Medal from this crew if just for the surf stoke in retro Stubbies flick. "Bill" played by Bill Bohlman Stubbies Contest Director & Spruiker. Now we Groms ever thought that Bill was a car Salesman from Tweed Motors? Famous for OTP surf/contest reports on 4GG radio. Half of the Tweed coast upper beach is out the back waiting for a solid southerly buster bus to come along. The jetty can't do much at such short notice as Rabs has said. Deltas grow bigger, Nature rules. You get what you get. Sand has been creeping into Snapper from Froggies for the last couple of days. This morning on the dropping tide there was a short, hollow but viable wave. But it has to be said the whole circus is a big ask on the local community just so some corporate dicks in suits can sell a few crappy made in China tee shirts and boardies.